Renew Your NASCAR Licence ASAP! ATTENTION SUNSET DRIVERS & CREW MEMBERS – As of January 1, 2018 you are able to renew your 2017 NASCAR Licence online. Please go to www.nascarmembers.com to log in with your 2017 licence number. All applicants between the ages 14 & 20 are also required to complete the minor form as well. Please note – This feature is available ONLY if you had a NASCAR Licence in 2017. 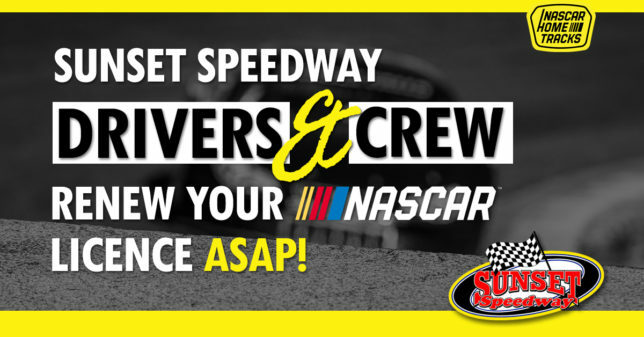 All crew members and drivers are required to have a NASCAR licence BEFORE opening night! If you have any questions, please contact Carol at 705-795-1940 or email carol@sunsetspeedway.ca.